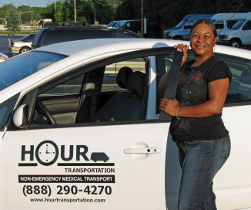 ﻿ HOUR TRANSPORTATION - ABOUT - Michigan Ambulatory and Non-Ambulatory Wheelchair Non-Emergency Medical Transportation NEMT Transport serving Metro Detroit, Ann Arbor, Southeast Michigan and Southwest Michigan. Services for the disabled with all types of disabilities specializing in no-fault auto claims transportation needs with branches in Southfield, Ann Arbor, Flint, Grand Rapids, Kalamazoo, Shelby Twp and Lansing. "To consistently provide the community with prompt, dependable and safe transportation services through cooperative customer and employee relationships." Hour Transportation was founded in 1997. Our current management team joined the company within months of the company's founding. The company was established with the idea of providing quality non-emergency medical transportation with an emphasis on a high level of customer service and the utilization in the latest in technology. From our humble beginnings of only one van and one client in January of 1998, we have grown into one of the leaders in our industry. We now have a fleet of over 25 vehicles and we intend to continue our growth and expansion to better serve our customers. Our success is due in large part to the character of our employees. Our drivers and our office personnel have given our company the reputation of being honest, dependable and easy to do business with. "You have been timely, your vehicles are comfortable . . . your drivers are considerate and cordial to clients and each other." "I . . . cannot ride comfortably with anyone else driving. I am also nervous about being in confined spaces and situations with strangers. Within minutes, I was comfortable with your drivers. They were both extremely pleasant and very courteous and helpful. I never had one anxious minute about their driving either." "Your driver was very courteous and made me feel comfortable." "Hour Transportation . . . got to where I was supposed to go safely. After being with them for the past 8 years they've helped me so much in learning and being a person again." "Hour Transportation & Staff. You are doing a great job." I . . . cannot ride comfortably with anyone else driving. I am also nervous about being in confined spaces and situations with strangers. Within minutes, I was comfortable with your drivers. They were both extremely pleasant and very courteous and helpful. I never had one anxious minute about their driving either.